For those of you in the Bay Area that are lucky enough to enjoy a day off today, the Yerba Buena Center for the arts is holding “Sustaining the Dream Through Community and Service” at the Yerba Buena Gardens this afternoon, and local museums (MoAD and the Contemporary Jewish Museum) are offering free admission today. The event is being held at one of the most beautiful monuments I’ve ever seen and is the crown jewel of the Yerba Buena Gardens. I was enamored with this fountain before I realized it was a memorial to Martin Luther King Jr. So if you can’t get to Yerba Buena today, this fountain is a must see for visitors to San Francisco, or for natives who think they know the fountain but haven’t scratched the surface beyond it’s aesthetically beautiful facade. 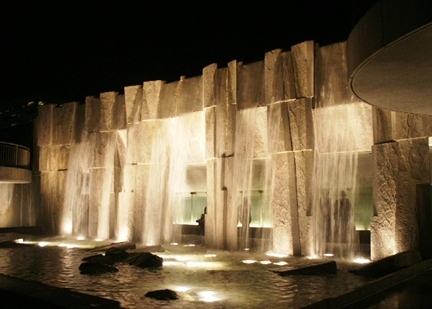 The fountain is a cascading wall of water descending from the upper level of the Yerba Buena Garden’s plaza down to the park. Behind the wall of water lies a series of glass encased pannels featuring quotes of Reverend Martin Luther King Jr. The sound of the wall of water is deafening and adds a living, breathing dimension to the words on the wall. The entire cultural center is flanked by MOMA, St. Patrick’s, the Contemporary Jewish Museum and MoAD; it is literally my favorite square block of real estate in the entire world. For reviews on the Martin Luther King Memorial Fountain click here.